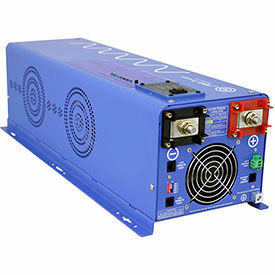 Power Inverters Provide A Mobile Power Source For Small And Large Power Applications. 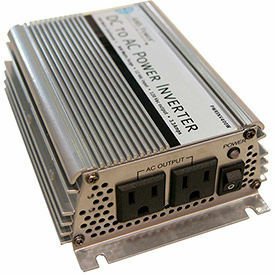 Power Inverters convert the DC electricity from batteries into AC electricity. Compact models are made for use with laptops, mobile phones or tablets, while larger models yield power for trucks, boats, RV's and more. THOR models include internal fuse protection. 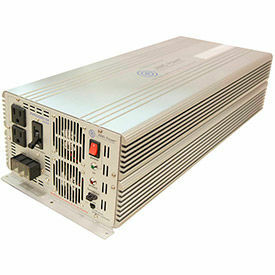 AIMS Power Inverters are made with an aluminum casing for long lasting durability. Continuous output watts range from 100 to 12,000. DC input operating voltages are 12, 24, 36 and 48. Output voltages are 120 and 240. AIMS Power, Pure Sine Inverters Charge Laptops, IPads, Smartphones, IPhones, MacBooks, Cameras And More While On The Road. AIMS Power, Pure Sine Inverters are solidly made for long lasting durability. Inverters feature AC outlets and USB outlets for versatility. On/off switch and DC battery alligator cables provide easy use. Load base fan, AC output short circuit protection and low battery voltage alarm provides added security to electronic devices. Continuous output watts are 300, 600, 1,000, 2,000, 3,000 and 5,000. Surge watts are 3,000, 4,000, 6,000 and 10,000 DC input operating voltages are 12, 24 and 48. AIMS Power, Industrial Grade Power Inverters Deliver Power To High End Equipment Requiring Substantial Electricity, Like Large Pump Compressors, Power Tools And More. 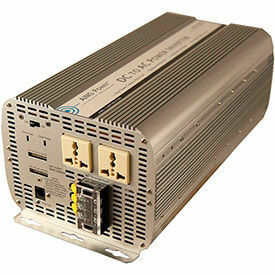 AIMS Power, Industrial Grade Power Inverters are made with an aluminum case for long lasting durability. PWM programming corrects fluctuation in voltage or frequency caused by battery fluctuation or sudden surges in power usage. Pre-wired for remote on/off switch and pre-slotted mounting plate provide minimal installation. Over load and over temperature LED indicators provide additional safety to electrical devices. 5 Externally located re-settable circuit breakers and on/off switch provide easy use. Continuous output watts are 5,000 and 7,000. Surge Watts are 10,000 and 14,000. Operating voltages are 12, 24 and 48. Output voltages are 120 and 240. AIMS Power, Pure Sine Inverter Chargers Power Essential Household Appliances During Power Outages Or To Use While Tailgating, Camping And More. 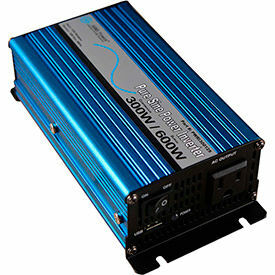 AIMS Power, Pure Sine Inverter Chargers are marine coated for long lasting durability. Charger accepts any source of 120v AC power to charge batteries including gas or diesel generators. Low battery voltage and high voltage alarm provides added security to electronic devices. 7 battery type settings and four stage smart chargers provide easy use. Over charge protection shutdown provides security to charger. Continuous output watts are 1,000, 2,000, 3,000, 4,000, 6,000 8,000, 10,000 and 12,000. Surge watts are 3,000, 6,000, 9,000, 12,000, 18,000, 24,000, 30,000 and 36,000. DC input operating voltages are12, 24 and 48. Output voltages are 120/240 and 120. AIMS Power, Inverter Chargers Are Used For Mobile Power Needs At Sporting Events, Worksites, Campsites And More. AIM Power, Inverter Chargers are marine coated for long lasting durability. Built-in smart battery charger with 3 stage charging and battery type selectors ensures batteries are properly charge and maintained. Low battery alarm and high voltage alarm provides security to electronic devices. Four stage smart chargers, adjustable charge current and 7 battery type settings provide easy use. Continuous output watts are 4,000 and 6,000. Surge watts are 12,000 and 18,000. DC input and operating voltages are 12 and 48. Output voltages are 120/240 and 120. AIMS Power, European And African Power Inverters Power Electrical Devices In Countries That Require 50 Hz. AIMS Power, European And African Power Inverters are made with an aluminum case for long lasting durability. Front panel has digital gauge display. DC voltage and amp draw allows user to actively monitor equipment with easy to read gauges. AC direct connect terminal and on/off switch provide easy use. Single cooling fan, temperature and over load LED indicators provide additional security to electronic devices. Pre-wired for remote on/off switch and pre-slotted mounting plate provide minimal installation. Continuous output watts are 5,000 and 8,000. Operating voltage is 12. Output voltage is 220. Power Inverter Accessories Aid Power Inverters And Charger During Power Outages Or To Use While Tailgating, Camping And More. Fuses With Blocks provide protection from damage caused by short circuits or overloads. 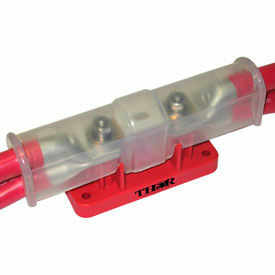 Includes fuse, block, fuse holder and two fuse holder terminal insulators. Battery Isolators allow bi-directional charging from alternators or shore power. On/Off Remote Switches allow inverters to be controlled remotely in the vehicle. Includes cable and mounting screws. Cable Sets include cables, lugs, protective fuse and fuse holder.